Insurance is not included in the tour price. Credit cards are not accepted. Tour reservation one week in advance is requested. Tour guide Takashi reconfirms your application. (1) your name (2) name of your country (3) number of participants (4) desired tour date (5) name and phone number of your hotel at Kanazawa or Toyama. (Sample itinerary)9:21am Kanazawa station - 9:35am Shintakaoka - Zuiryuji temple - 1:00pm Takaoka - 2:18pm Ainokura 3:35pm Ainokura - 4:45pm Shintakaoka - 5:31 Kanazawa. Tour's starting place can be arrange at either Kanazawa or Takaoka based on negotiation. Tour guide fee: a group of not more than 15 persons: 24,000 JPY . Admission fee/person: Zuiryuji temple, \500. Ainokura folk museum, \200 . \2,000 Shintakaoka - Kanazawa ￥1,530. Lunch and personal expenses are not included. Transportation fares for tour guide and a lunch are requested to be paid by customers. Tour starts at 9:00a.m. and ends at 5:00p.m. It takes about 8 hours. We will meet you at your hotel lobby at 9:00a.m. Tour ends at your hotel lobby, or another agreed upon location. Zuiryuji Temple is situated at Takaoka City. The 3 buildings of the temple was designated as national treasures in 1997. 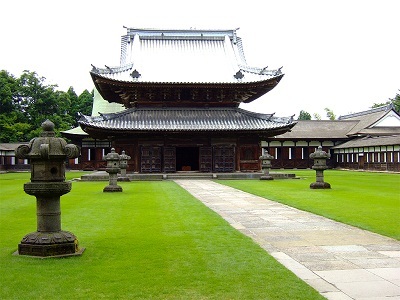 The temple was constructed in 1663 to dedicate for Toshiie Maeda, the second generation of the lord Maeda. The temple is Soto sect of Zen temple. It is a big temple, and the temple buildings are connected with a long corridor. 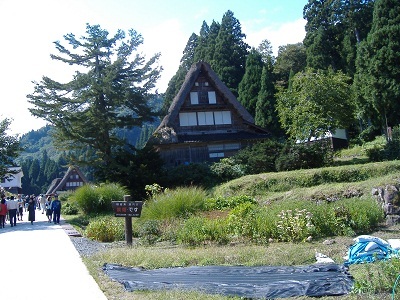 Ainokura village has 20 Gassho farmhouses. Gassho means the palms of both hands crossed together in a prayer. Many of them are 100 - 200 years old. This region is a heavy snow fall region. The slope of the roofs is 60 degree incline, which makes snow fall sliding down easily. The village is situated off the beaten track secluded area. Visitors can enjoy the calm mountainous village scenery.